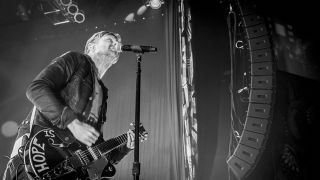 Multi-platinum-selling, Grammy Award-winning band Switchfoot recently wrapped up its 10-week Looking for America Tour with Grammy-nominated alt-rockers Relient K co-headlining all 51 shows. Ryan Nichols, a 27-year veteran of the industry who has been with the band for the past 14 years as FOH engineer and production manager, took the opportunity on select dates to help roll out Bose Professional’s new ShowMatch DeltaQ array loudspeaker system, which was previewed at InfoComm 2016. ShowMatch’s USA road premiere included venues in Chicago, along the East Coast and in Dallas at the House of Blues. While rugged enough for touring, ShowMatch is designed for both permanent installations and portable applications, with field-changeable waveguides in compact enclosures that can form DeltaQ, constant-curvature, or “J-shape” line-array configurations. RoomMatch was never designed for portable or touring applications, and based on feedback from customers, Bose developed ShowMatch to provide a system that can be used for either. ShowMatch is suitable for installation in small clubs and houses of worship up to the largest performing arts centers and corporate AV productions. For the Dallas gig, the crew flew two hangs of 14 ShowMatch modules with four boxes for lip fill and three ground-stacked RoomMatch RMS218 subwoofers per side. Four racks of six PowerMatch PM8500N amplifiers drove the main system, with two additional PM8500Ns available for front and auxiliary fill. Bose Professional also took the opportunity to demonstrate its technology to representatives from some of the pro audio publications at the Dallas show. Morten Jørgensen, senior manager, Bose Professional, Americas, was available to explain that the DeltaQ concept common to both ShowMatch and RoomMatch enables operators to tailor the directivity in both the horizontal and vertical planes and surgically aim the sound at the audience. “We believe it starts with vocal clarity. Any energy we shoot into the ceiling or the side walls is going to come back as reverberant energy, and that’s going to decrease the clarity,” he said. “If you’ve got to get sound all the way to the back you need something with a high Q. To get to the middle, you need something a little wider to get out to the sides, and wide vertically as well. Up close to the array, you’ve got to cover the seats all the way at the sides, so you need something really, really wide horizontally, and wide vertically as well. Typically, the Q will vary as you go down the array—it’s a high Q at the top, and it gets lower and lower as you get down to the bottom—hence the name DeltaQ,” Jørgensen said. Vertical directivity from the four compression drivers is dependent on the specific model of array module, which provides either 5, 10 or 20 degrees of coverage. Vertical pattern control is dictated by the curvature of the manifold holding the drivers. Horizontal pattern control is dictated by each box’s field-changeable waveguide. There are four options—55, 70, 100 and 120 degrees—and each module ships with one waveguide fitted plus an alternate, with other waveguides available as options. “Undo two screws on the top, two at the bottom, slide in the new waveguide and put the screws back in,” said Jørgensen, noting that the two waveguides do not have to be the same angle, allowing the creation of asymmetrical modules. Each two-way array module also features a pair of proprietary 8-inch neodymium woofers derived from their RoomMatch counterparts. The ShowMatch woofer incorporates design changes that enables it to produce greater SPLs while minimizing thermal and power compression. A typical ShowMatch array can deliver up to about 145 dB peak. The ShowMatch line also includes a single-18 sub that is physically and acoustically matched with the full-range modules. Unique to the system is its ability to be arrayed in multiple configurations, including a standard constant curvature configuration, the J array for long-throw, high-SPL applications, or a DeltaQ array. “No other product on the market can do all three of these array types from a single set. It gives you true flexibility,” said Jørgensen. Each array frame supports up to 24 modules or 18 subs.